MELINDA: Hello. It is snowing at my house and I’m feeling very cranky. How about you? MICHELLE: *points and laughs* It’s warm and sunny here! Internet connectivity woes are making me slightly cranky, though. Perhaps we can get our minds off what ails us by talking about some manga! MELINDA: Perhaps so! Do you have some healing manga to share this week? MICHELLE: There’s one that always brightens my mood, but I think I’ll save that for last. 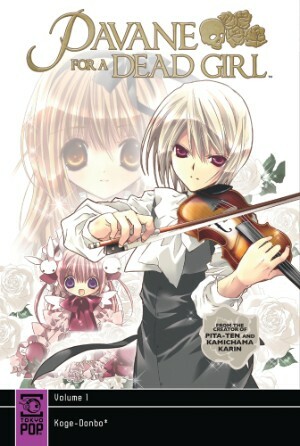 First up, I’ve got the debut volume of Pavane for a Dead Girl, a new series from TOKYOPOP. I read one volume of a Koge-Donbo series back in 2004 and thought that was quite sufficient for one lifetime. Pavane for a Dead Girl tempted me, though, with its late-Meiji music school setting. We begin—in an inauspicious and jumbled way—as a new student named Nanao Kaga is about to commence studying at the school where she once long ago heard a lovely violin melody being played by a boy whom she dubbed the “prince of harmony.” lmost immediately, Nanao runs into the boy again, who just so happens to be playing the same tune. “What beautiful music. Like a dazzling jewel overflowing with love and radiance,” Nanao opines. The boy is named Takenomaru Sagami, and gives Nanao a brooch that is at first clear but progressively becomes a deep amber in color. She’s soon head-over-heels in love with him, but what she doesn’t know is that, in exchange for good looks and musical talent, Takenomaru has made a bargain with the “great angel” to “capture the tears of Maria.” What this basically means is that he has to bestow a brooch upon a pure-hearted girl, encourage her to love him, and then stab her in the heart once the brooch indicates that her feelings have reached maximum capacity. In the right hands, this could be an interesting concept. Dark, brooding hero is doomed to be eternally alone, because he must kill every girl who loves him in order to survive. Perhaps it will even go there eventually—I can’t believe I’m actually willing to read a second volume of a Koge-Donbo series!—but the execution is hampered by this being the most moe-tastic thing I’ve ever seen. None of the female characters registers even remotely as a fleshed-out person, and one gets the impression that they’re only there to fall for and be slain by Takenomaru in turn. Maybe this could end up being something like Higurashi When They Cry, in which moe and darkness coexist, but I’m a little dubious. Curious, but not wholly convinced. MELINDA: I think overall I have a more generous view of “moe” and what that can mean for a series, but semantics aside, this sounds pretty dubious. There’s the potential for a sort of Princess Tutu-flavored darkness in the scenario you describe, but it sounds like the execution has a looong way to go to match that kind of depth. I’m quite sad to hear it, actually. MICHELLE: Admittedly, I don’t have a lot of experience with moe and don’t mean to blast it in ignorance, but the flatness of the female characters is inescapable. Takenomaru doesn’t really fare much better, but at least he has a traumatic backstory and a cruel bargain to live up to. How about you? Read any doldrum-vanquishing things this week? MELINDA: One of my titles definitely falls into that category, and I’ll start with that in hopes of buoying us up for the evening! 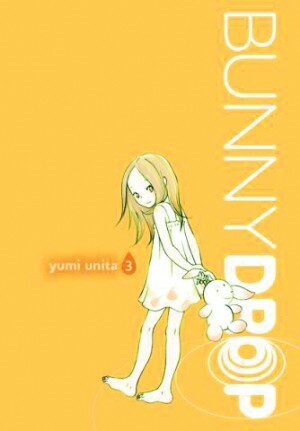 That heart-warming manga would be volume three of Yumi Unita’s Bunny Drop, out just this week from Yen Press. Honestly, it’s hard to imagine that this series could ever become anything but warm and charming. This volume begins with a milestone, as Rin’s first day of elementary school approaches. As Daikichi finds himself unexpectedly anxious about letting Rin walk to school without him, he’s also faced with a reality check at work, when a flirtatious female coworker abruptly loses interest after he tells her he’s raising a child. This volume’s biggest challenge, however, continues to be Rin’s birth mother, whose dispassionate attitude towards her child leaves Daikichi alternately angry and confounded. I know I already made this comparison in my discussion of the first two volumes, but it’s continuously fascinating to me just how differently this series reads from Yotsuba&! thanks simply to its marketing demographic. Nothing against Yotsuba&! of course, but the focus on actual parenting in Bunny Drop stands in such stark contrast to that series, it’s almost funny. As a non-parent, I might expect this to be tedious, but in this artist’s hands, it’s anything but. What Unita manages to capture here is not just the challenges of parenting or the (presumably) relatable humor and fear, but the honest-to-goodness joy of it, in terms that even a child-free old biddy like me can appreciate. Rin may not be as unique a soul as Yotsuba is, or at least less obviously so, but she’s such a little person, it’s impossible to avoid slipping into Daikichi’s POV. We experience everything here just as he does, and we experience it intimately, as though immersed in his feelings. It’s a beautifully written series, and it just keeps getting better, volume after volume. MICHELLE: I probably said this exact same thing last time, but I am totally committed to reading this series in the near future. Your description warms the cockles of my poor, withered heart. I also love how Rin gets progressively older on each cover. The series just ended recently in Japan, I believe, and I wonder if she makes it to adulthood by the end. MELINDA: You will love it, Michelle. Really and truly. It’s one of my favorite manga series currently running. So, what’s this mood-brightening card you’ve been holding onto over there? MICHELLE: Only my beloved Skip Beat! For those not in the know, this is the story of Kyoko Mogami, a teenager who was betrayed by her first love after she followed him to Tokyo and supported him while he made it big as a pop star. After learning how he really viewed her, she vowed to get even by surpassing him in show biz. This might sound a bit like Honey Hunt, but trust me, Skip Beat! is the better series. For one, it focuses pretty intensely on Kyoko’s evolution as an actress. In this volume, for instance, she is practically living the role of Natsu, the leader of a group of mean girls, a part she initially had trouble getting into until she succeeded in differentiating it from another villainous role for which she’s become moderately well known. 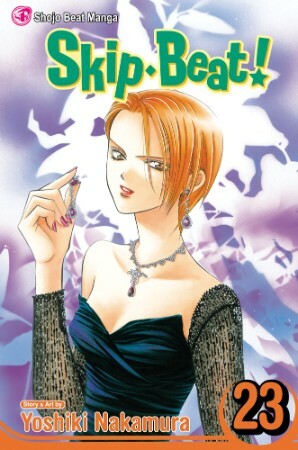 Although Kyoko does have a love interest of sorts (although she’s oblivious to his feelings) in fellow actor Ren Tsuruga, he appears for all of three pages. Instead, it’s all about Kyoko’s professional growth and the rivalry her ability to transcend a notorious role inspires in a costar who hasn’t been able to get beyond a certain part she played as a child. Have I gushed sufficiently? Skip Beat! may be lighthearted, but it’s tremendous fun to follow Kyoko’s rise to stardom and to root for her and Ren to get together one day, though I’m certainly in no hurry about that. I’ve read twenty-three volumes without tiring of the series in the least, and would happily read twenty-three more. MELINDA: You know I’m embarrassed to have never gotten into this series, and now I’m chomping at the bit as well! So much manga, so little time! This really sounds delightful. How many volumes are there in total? MICHELLE: Volume 27 came out in Japan in February. I’m not spoiled on the goings-on, but I haven’t heard any murmurings of it ending any time soon. So, if you started with the buoying title, does that mean your other one’s a bit of a downer? MELINDA: Mmmm, I’d say “downer” is a pretty strong word, but it’s definitely dark and not as expertly crafted. My other read this week was the second volume of Kim Hyung-Min and Yan Kyung-Il’s March Story, due out soon from Viz. This series is still very much finding its feet, and nowhere is this more obvious than in this volume’s storylines. While the series’ first volume fell pretty squarely in what’s become known as “Comeuppence Theater,” in which foolish or selfish characters suffer horribly for their vices, this volume leans heavily towards poignance and compassion–still dark, but with a very different tone. As in the debut volume, “Ciste Vihad” March encounters a number of demons known as “Ill” who lurk in beautiful objects, hoping to possess unwitting humans. In this set of stories, however, most of the Ill are deliberately sympathetic characters whom March feels compelled to help rather than destroy. March’s associates, too, all fairly terrifying in the series’ first volume, have been quite humanized here, particularly the giant-headed Jake and supernatural antique dealer Rodin. Quite a few of the tales are genuinely touching, involving Ill motivated by love or other emotional attachment they simply can’t let go of. Add in the series’ intricate, latticed artwork, and one must acknowledge some moments of real beauty. It’s a real step forward, I’ll happily admit. I like the series’ new, softer tone. What this volume suffers miserably from, however, is a maddening lack of its title character. After finally winning us over in the first volume’s late chapters by getting us really invested in March, her creators have all but tossed her aside in favor of these “touching” episodes, sucking out some of the life they’d so painstakingly put into it. I’m not giving up on this series by any means, and honestly I’d pick it up just for the pictures! But I’m not sure yet what kind of story this wants to be, and I’d guess its creators are (or were, at least) in the same boat. MICHELLE: Yeah, it does sound pretty uneven. The progress of March’s relationships withi the demons reminds me a bit of Natsume’s Book of Friends, in which the yokai quickly establish themselves as sympathetic. I hope March Story evolves into something as nice as that series. MELINDA: I’d be a bit surprised, if only because I think it’s got a different agenda. But there’s definitely stuff to work with if its creative team can find its feet. So, hey, are you feeling better? MICHELLE: Yep! And my internet seems to have stabilized. How’s the snow? MELINDA: Pretty much petered out, at least for the moment it seems! I call this a job well done! MELINDA. Read Skip Beat! You won’t regret it. Oh, you best read Nodame Cantabile anyways. Another vouch for it from me!! A perfect companion to Skip Beat! because it’s classical music to Skip Beat’s acting. Arts manga are really something special. I guess the show biz theme might not appeal to many people as it is not a new thing but I do agree that Skip Beat! is enjoyable. The only thing is that it has been dragging on and it doesn’t look like we will see something happening between Ren and Kyoko anytime soon. I don’t really mind but it can also be infuriating. If people think Kimi ni Todoke was dragging on for so long, then what would they say about Skip Beat!? While both are popular, I think Kimi ni Todoke is more loved. I have only read the first volume of Bunny Drop but do plan to get more eventually. I love slice of life stories. Another slice of life that I really loved was Keiko Tobe’s With the Light: Raising an Autistic Child from Yen Press. Sadly the mangaka has passed away and so the story never ended. It is a good read, though and I highly recommend it. This batch was pretty eclectic, I am interested in all of them. Funny, I just bought Bunny Drop 1 because I was looking for another series to smooth over the pain from lack of new volumes of Nodame Cantabile. You know, a quirky Josei just like NC is what I need. Also, because Pavane is music-related, that looks like a maybe. And speaking of Pavane being Moe, it looks more like a stylized moe because I know Moe all looks the same but I haven’t seen one that looks like Koge Donbo’s work. 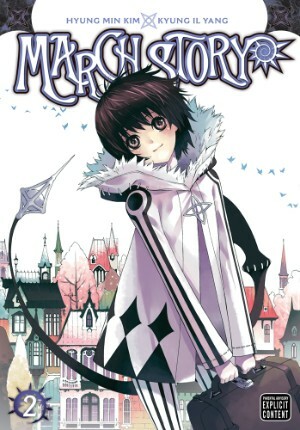 The cover to March Story looks beautiful and “Comeuppence Theater” sounds intriguing.